Increase your comfort and prevent fatigue while standing at your desk, with this ergonomically designed floor mat. 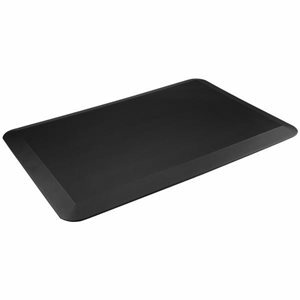 Work more comfortably at your standing desk or sit-stand workstation, with this anti-fatigue mat. It offers a durable cushioned surface to stand on throughout your workday, and it's conveniently sized to tuck under your desk when you're not using it.This durable anti-fatigue mat helps you stay comfortable while enjoying the health benefits of not sitting in a chair all day.Standing for periods during your day can bring many health benefits, including increasing your body's metabolism and alertness. Now, you can work in greater comfort with this anti-fatigue floor mat. It's ergonomically designed to encourage movement as you stand, which helps to increase blood circulation, and reduce strain on your feet, knees, hips and back. Through increased muscle movement, you will experience less fatigue and strain, resulting in greater comfort throughout your day.The anti-fatigue mat is made of premium polyurethane foam, providing effective cushioning for maximum comfort and durability. The water-resistant surface is designed for long-lasting performance and easy cleaning. The anti-fatigue floor mat is conveniently sized at 20" x 30" (508 x 762 mm), large enough to allow freedom of movement, while compact enough to tuck under your desk when not in use.The anti-slip bottom ensures the standing desk mat stays in place and helps to reduce the risk of slipping. The beveled edge also helps to prevent tripping as you move throughout your work day.Please note: the anti-fatigue mat is not intended for use with high heels, which may cause damage to the mat surface.